Beware of Cat! 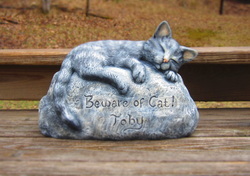 Ceramic engraved and customized cat garden decoration. 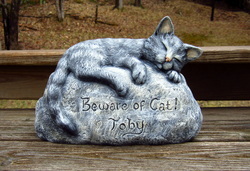 Send us pictures of your cat and we will custom paint the garden decoration in the likeness of your cat! Contact us in advance to discuss pictures and custom engraving. Extra engraving or challenging colorings may incur an extra (small) fee. The piece pictured is just an example - the piece will be custom made for you. Great for indoor or outdoors as it is weather proofed. 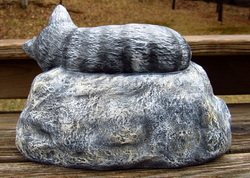 Makes an amazing gift to your cat loving friends or family. **This piece is hand made in my studio: we pour the mold, sand the item of any imperfections, and then fire the piece in one of our studio's kilns. If any alterations to the clay piece is required then we alter it while the piece is still wet and then fire it. The item is lovingly painted in a dry brush technique to create a very realistic look. A weatherproof finish is approved as the final touch.